I start the weekends early. Six o’clock in the evening on Friday early. This weekend’s opening ceremonies were a particularly good time: I wrapped up things at work right on schedule, then I pulled the freshly-washed and Z6’ed GTO out of the garage so that Apple and I could head out for dinner. After several straight days of “pop-up thundershowers” at inopportune times, we were luckily spared any rain at all today, meaning the car actually stayed clean until we got home, a rare feat during Florida summers. On our way to dinner we stopped off at the mall, where Apple picked up something cool for herself. Then it was on to our favorite Carrabba’s in East Naples, where we enjoyed another fantastic meal. Even better was the free large-sized platter of calamari that we received for filling out a survey after our last visit. We took home half of everything, as usual — meaning another full meal to be enjoyed later, for the price of one. At the end of our visit they gave us another survey, good for another free appetizer. You keep giving ’em to me, and I’ll keep filling ’em out. The initial setup and exploration of my new Sony Vaio F-series laptop has continued off-and-on since the machine arrived on Thursday; I’ve actually managed to not completely abandon my job in favor of geeking around with it. In fact, I got quite a bit done these last two days. New computer not withstanding, Thursday and Friday were a lot better than the first half of the week, which was a frustrating hair-pull of an affair. Eventually, on Thursday morning I got so fed up with the perceived disorganization at work that I spent an hour typing up a huge email on the situation, all but begging for clarification on a handful of very specific points. It was with some satisfaction that my immediate supervisor revealed himself to be almost as confused as I was, but I still await real answers to several questions. Back to the new laptop itself: I’ll have a full review here once I’ve actually worked with it enough to qualify myself. But so far, I think this thing is going to live up to my expectations of being the most ideal portable workstation possible. It’ll be great for working while traveling, its performance actually puts my desktop computer to shame and I’ve even figured out how to dial back all of the horsepower enough to make it serve as a subdued word processor for the evening hours. The latter required that I create a custom power management scheme that keeps the CPU constantly throttled to 5%. I can’t decide what I’m most impressed with: the keyboard or the solid-state drive. 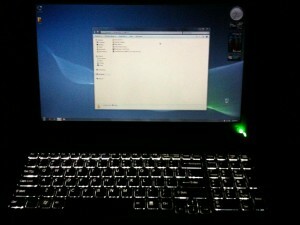 The former is, without a doubt, the best laptop keyboard I have ever laid hands on. I was typing on it this evening with all the speed of my regular desktop keyboard, and the backlight made it easy to see in the dark. The SSD, meanwhile, is the first of its kind that I’ve ever owned and the response times are astounding — and this isn’t even close to being the fastest model SSD on the market! You can boot the machine to ready-state in just a few seconds, it’s completely silent and it generates no heat. One of the weakest performance links of every laptop I’ve ever owned has been the hard drive, and it’s so nice to be rid of that. This weekend I have quite a few projects in store. 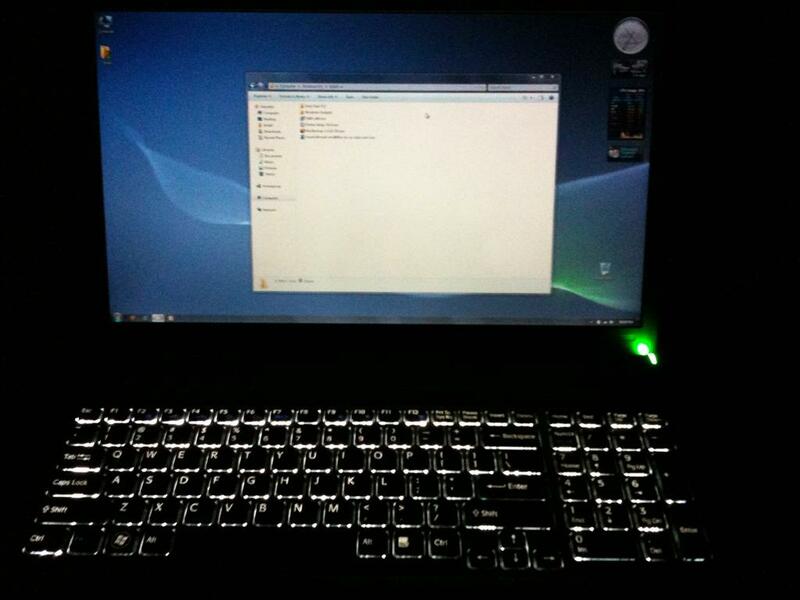 I’ve got some more setup to do on the laptop, primarily the installation of the Adobe software I use for work. I’m also going to switch myself into the seldom-used “handyman mode” and attempt to repair a toilet. I had to order the proprietary Mansfield replacement parts from some obscure vendor at the Brooklyn Navy Yard of all places, but the stuff got here yesterday and now I no longer have an excuse to sit by and listen to the toilet groan loudly every time you flush it. Also, I need to install the air filter I just had delivered for the GTO, clearcoat the touchup paint job I did on the wheel rim, then get the car up on ramps and check again on the status of the oil leak. There…might be a story behind that, depending on what I find down there. If I don’t say anything more on the subject, you’ll know that there isn’t. Oh yeah, and I would like to play some games too. I’m ridiculously wired tonight. Guess I’ll hit the sack, though. Would hate to waste half of Saturday sleeping it off. You had a late night or early day, one or the other. Hoping your Saturday has been good so far. Dad’s fighting off a summer cold (it’s been a helluva week for him), but is starting to feel better. First day in a long while we’ve had the windows open and no AC too. Late night, as it happens. 🙂 Great weekend so far. I got everything done — shopping, car maintenance, toilet repairs. All went off without a hitch. I think I should go get a lottery ticket. Computer looks great thus far. Need to get Skype installed. It has a webcam, so perhaps tomorrow we could try a video call? Sorry to hear about Dad, glad he is starting to feel better but WOW what a week it’s been for him. Hope everything starts looking up real soon! Sure, we can try a video call. We’re home tomorrow afternoon and evening.